Lets face it, it isn’t always easy to get dressed in the morning. I used to get completely frustrated when I couldn’t find anything to wear because…well..I have a huge selection of clothes. It all became a lot easier when I realized that all you really need to find a great outfit within your own wardrobe is to find 1 key piece as your source of inspiration and then just build around it. Sometimes it’s a scarf, sometimes its a top, and sometimes it can be a pair of shoes that inspires an entire outfit. On this day, I was inspired by something as simple as a brooch by the Crave Yard. 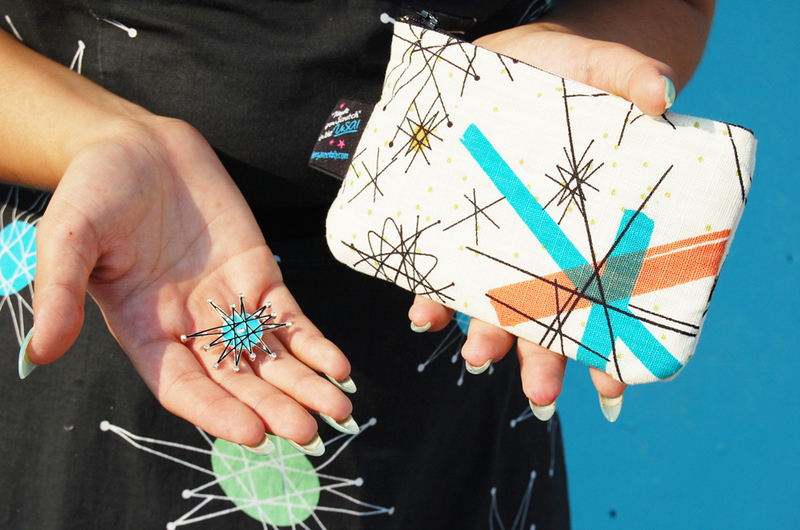 I adore retro prints, especially the classic starbursts and since I discovered Crave Yard at Viva this year, I have already acquired not 1 but 3 of their brooches..and a wallet! 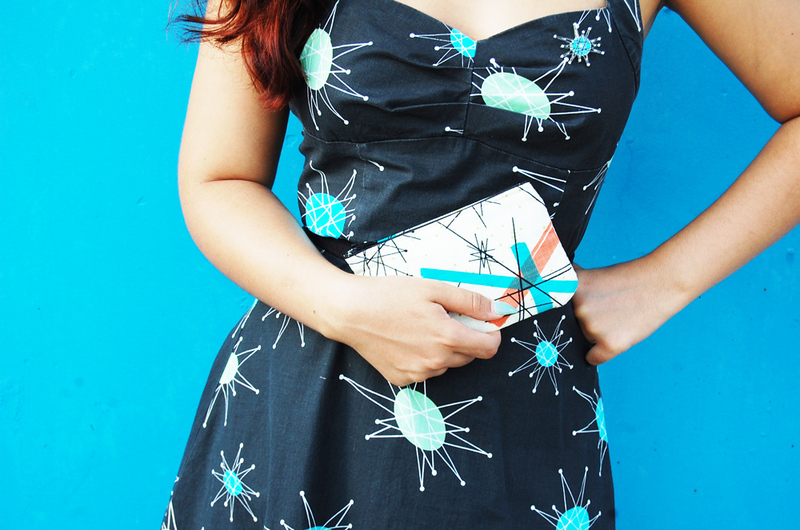 I admire that they create their own prints in which they use to create cute bags, wallets, brooches, aprons, and more. Coincidentally, I went to the Housing Works warehouse in Queens a few weeks ago and found this really cute retro dress by Super Low Fat for just $1 that matches my Crave Yard brooch and wallet, and like that…I had my outfit. Housing Works in Queens offers a buy the bag deal where you stuff all you can into a big brown bag for just $25. I am glad I found this dress underneath a big pile of clothing rubble. 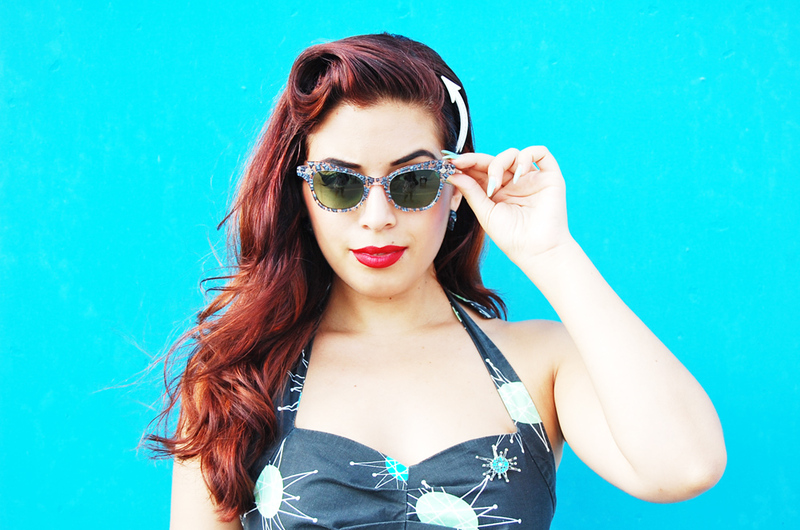 It all came together so perfectly for a hot summer day this labor day weekend and to add the icing on the cake, I wore my new vintage cat-eye sunglasses and my retro arrow hair comb from Reminiscence. I wanted to be comfortable so I wore my wedges from Payless (because I would never spend more than $20 for flats) so if you round about my outfit cost in total from head to toe, you are looking at just under $50. I call that Inspiration at it’s best and cheapest! Love how these Crave Yard accessories match my dress perfectly! I placed the brooch on the left side of my bust. It looked like it was part of the dress! How cute is this little wallet? It was perfect for my trip to the mall with my mom. Sometimes I like to take a bag-lady break. An entire match made in fashion heaven. My new cat-eye glasses are KILLER and I can’t wait to wear them this coming fashion week. They are clear with tiny little blue specs and I love it when I find vintage cat-eyes with green lenses. Oh yeah, and that’s my arrow hair comb that I love so much. Great combination! Especially love the brooch and wallet. perfect match, lady… I really like your new hair color with the turquoise background! Great outfit! Id love to see a hair tutorial for your hairstyle. Im always on the lookout for new vintage hairstyles. The purse and dress look so great together! Also, I am loving the buy a bag idea. Brill. Tomorrow I shall share some of the uh-mazing shopping finds what I found and shopped, and then, alas, I suspect a return to normality beckons. I won that atomic pin placing top five in a pinup contest!! I love all their designs!! 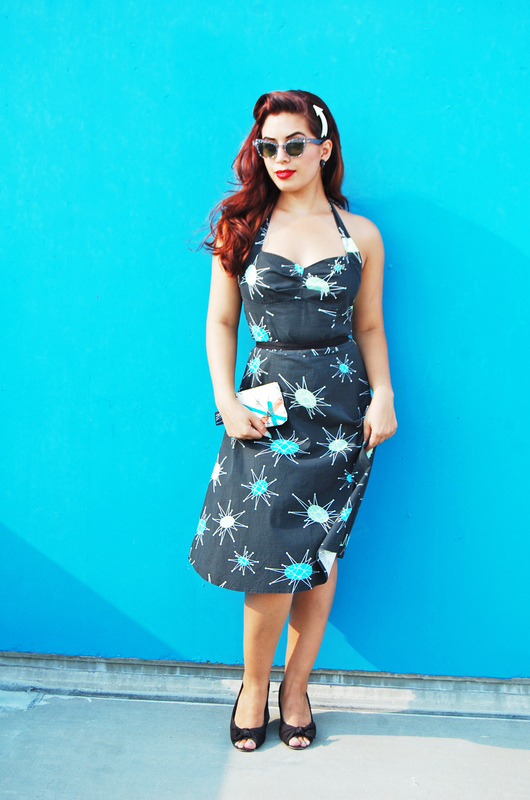 You are such an inspiration for wearing vintage! 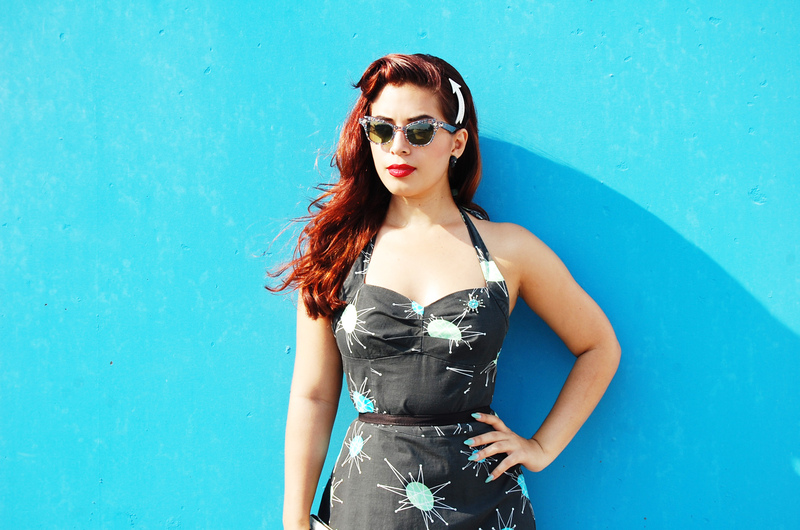 I’ve only recently started adopting vintage into my wardrobe and I’m loving the beautiful vintage ladies I find across the blogosphere. And miss, ooh-la-la, you’re gorgeous! You look fab – love how the accessories match your outfit! Since this is my dish pattern, I can’t even express how much I want this dress! 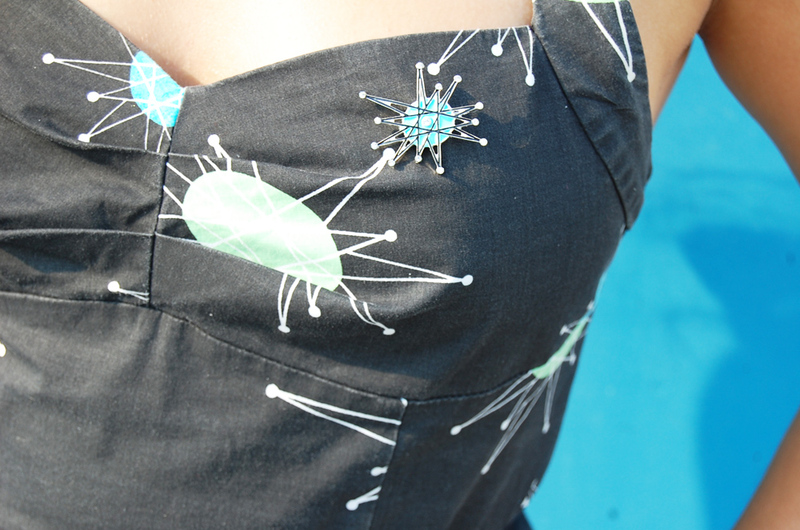 I have three of the Crave Yard’s brooches and love the rest of their stuff too. Wow! Those glasses are amazing! You always find exclusive shades. SO weird. I have this exact dress. I thrifted it about 2 years ago for less than $10.